Ceecee wrote: Is the Brewery Market coming back to Ottawa this year? Yes, we have four dates in Ottawa this year. We just (a couple of days ago) received approval from the city to use Hintonburg Park again. Now we need to get our SOP to make it official. I'll post up dates soon! Cass, is the Brewer's Backyard dog friendly? Sorry Ren, Evergreen does not permit dogs in our event space. 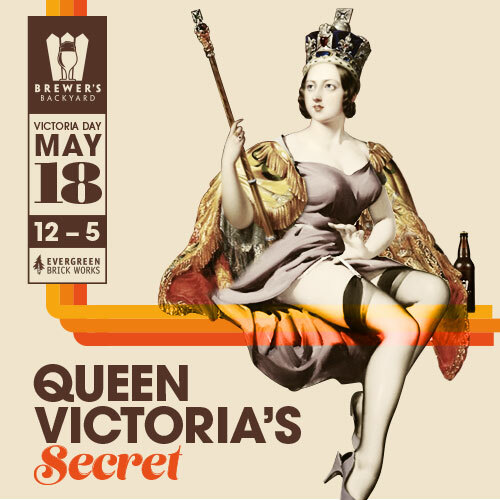 We're back on Victoria Day with Queen Victoria's Secret. Featuring Sawdust City, West Avenue, Side Launch, Publican House, Silversmith and Muddy York. Some new artwork for Monday's event. We'll be having Tilde Taco from the Danforth and Bunz in serving up food. There's also going to be the sequel to last year's "Balmoral's Outrage", this year entitled "Balmoral's Revenge". A barrel aged beer flavoured with various botanicals, in partnership with Sawdust City. Thanks to everyone who came out yesterday to the Brewer's Backyard. The rains held off, although we were fortunate to have a massive tent over Koerner Gardens that was leftover to keep us all in the shade. Next up Canada Day back at the Brick Works. Thanks for everyone who came out on Canada Day and who are at the Marché des Brasseurs today. Both awesome events! Will there be a beer list released for this Saturday's Brewery Market in Ottawa? Ceecee wrote: Will there be a beer list released for this Saturday's Brewery Market in Ottawa? Covered Bridge just tweeted their list. Our @brewmarket line up. The Lumbersexual, the Raspberry Princess, Chinatown's Showboat Paddle SMaSH, the Weight Limit (barrel-aged brown), Stittsville Sour, Cabane a sucre, and Double-Double... and a cask! Looks like it's going to be the perfect day for beers in Hintonburg park. Hope to see you there! The whole lineup has been released. Looks really good! Look for me...I'll be the one wearing a whimsical beer shirt. I'll be spending a lot of time with my kid at the playground and splash pad. Ceecee wrote: The whole lineup has been released. Looks really good! Sorry for not responding earlier, I didn't have the list ahead of the release, it always comes together at the last minute. Hope you had fun! Are there any more dates slotted for Brewers Market in Ottawa. I seem to remember a late one last year.